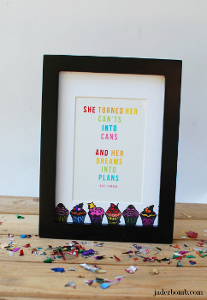 Turn your favorite phrase into a work of art by displaying it in a Creative Cupcake Frame using PLUS America products. You only need three products to create your own version of this delightful project. Decor craft ideas can quickly (and cheaply) change the look of your space. Start by taking your frame apart. Set aside the frame and the glass. Place the matting on a clean surface, preferably a clean towel. Place the cupcake roller on the left end of the matte and slowly roll across to the other end. Make sure to add a little pressure when rolling. Apply a little pressure so each cupcake comes out good! Wait 15 minutes for the ink to dry before you start coloring them in. Fill in each cupcake with the color theme you choose. Place any picture inside to display. Never roll directly on top of your counter, always place towels or napkins under your working spot. Practice rolling on a separate sheet before you do your matte boarder.